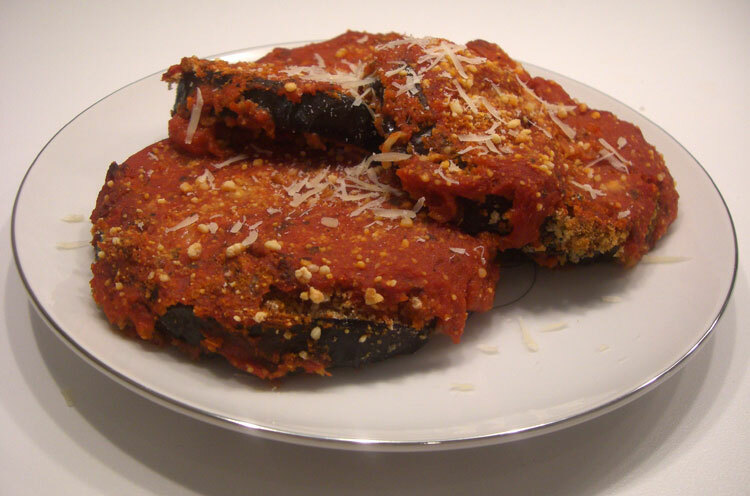 If you like traditional Eggplant Parmesan (which is fried), you will love this healthy alternative. This is from my Moosewood Restaurant cookbook. Preheat oven to 375 degrees. Lightly oil a baking tray and a 9×13 inch pan. Cut the eggplants into ½ inch thick slices. Put the milk in a shallow bowl. Combine bread crumbs (and wheat germ) and spices on a plate. Dip each eggplant slice into milk, and then coat with the breadcrumb mixture. Put the slices on a single layer (use both pans), and bake until tender, about 20-30 minutes. Remove from oven, and pile them on to baking tray. In the 9×13 pan (no need to clean after baking eggplant), ladle sauce into the bottom. Add a layer of eggplant slices, and cover with more sauce. Top with cheese, and repeat until you use all of your ingredients. Sprinkle top with parmesan. Bake uncovered at 375 for about 40 minutes, or until heated through and bubbly around the edges. Remove from oven and let sit about 10 minutes before serving.